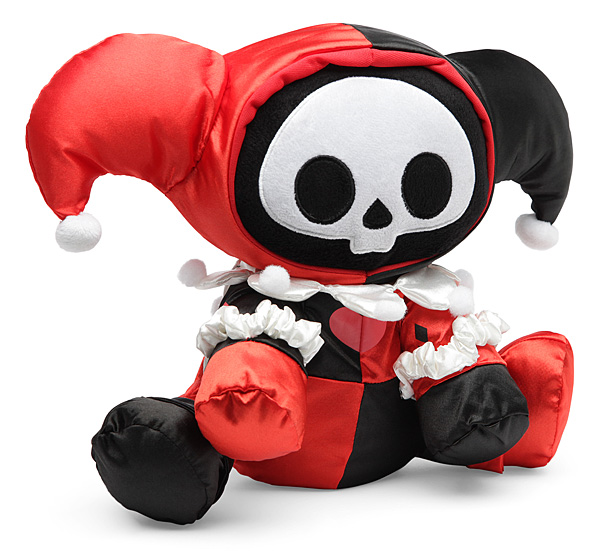 She's Fantastic: Skelanimals HARLEY QUINN! I've been impressed with Toynami's Skelanimals line since I first discovered them many years ago at a Hot Topic. This was before skulls became a popular mainstream design motif on kids' clothing so it was something of a shock to see a plush cat skeleton.. especially a cute one. I intended to buy them for all my friends' little babies, but every time I either couldn't find them or had second thoughts about their appropriateness for a 2 year old. I actually just wanted one for myself, but couldn't justify having a stuffed animal amongst all my "super mature" collectibles. Then at Toy Fair last year I finally saw a perfect Skelanimal for my picky sensibilities: The Harley Quinn 3" Vinyl figure. It took forever for her to be released and ever longer for me to find her in store, but she was worth the wait. Now I can't wait to get all those upcoming DC Hello Kitty products so she's not so lonely in her adorableness. I didn't realize till I had her in my hands that the 5 figures in Series 1 are all existing Skelanimal characters dressed up as DC Heroes. In this case Marcy the Monkey is dressed as Harley (the curly tail tipped me off). Let's check her out! Marcy/Harley is holding a pie and her signature Mallet. The mallet is removable and fits in her palm with the aide of a peg. Look at that cute lil' tail! Aside from her mallet, Harley also comes with a figure stand. Harley head is articulated and can swivel around on her neck. The mallet can be raised up or lowered to the ground depending on which way you orient it in her (stationary) hand. When it's raised, however, it severely limits the angles that the head can be positioned. 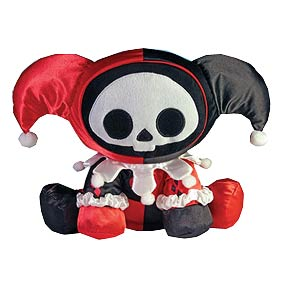 Marcy the Monkey as Harley Quinn also comes in a plush form. Here she is with the Hot Topic Exclusive Funko POP! "Harley Quinn with Mallet."